Say it with Custom Made Vinyl Cut Sticker. vehicles, boats or business advertising. I have listed some popular stickers on in my store. These can shipped within Australia with a set fee. Payment via Paypal or cash if local and can pickup. Vinyl cut stickers are cut to shape, this eliminates the need for printing inks and background material. Vinyl cut stickers are also called Computer Cut Decals or and Die-Cut Decals. Vinyl cut stickers create a professional appearance for signs, windows, cars, trucks, boats industrial & commercial equipment, in fact you can apply vinyl decals to any clean smooth surface, so are great across many applications. We provide vinyl cut stickers on pre-spaced and pre-masked sheet for an easy, quick and professional application. Depending on the vinyl quality used, they have an outdoor life from 1 year up to 8 years. 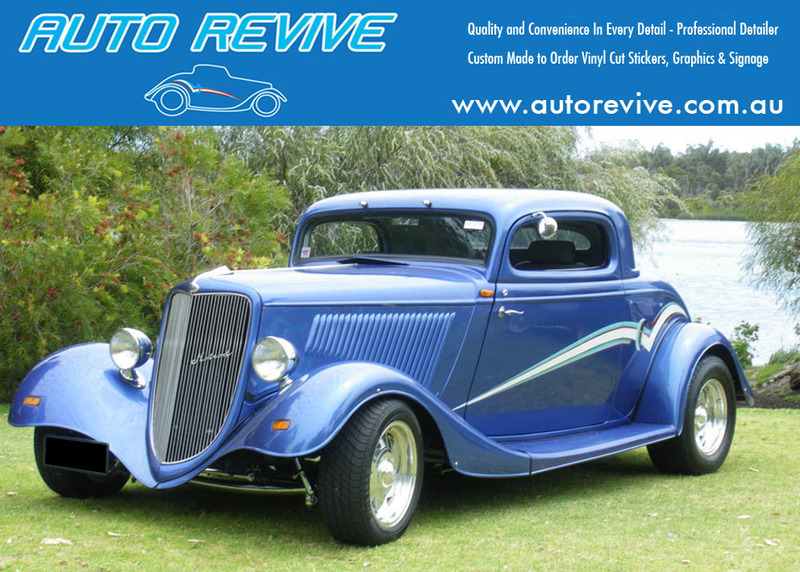 Auto Revive uses a Premium vinyl that’s rated up to 8 years outdoors continuously. Most bubbles will disappear within a few weeks, if there are any remaining, use a pin to pierce the bubbles and use your finger to press the air out. No. Vinyl is not printed, it is dyed and cannot fade however it will break down over time with prolonged exposure to the sun. Yes, using layered vinyl colours, vinyl cut stickers can be made in multiple colours, however, this is considerably more expensive as there are more materials and labour involved.